Font (Ctrl + D) : This option is used to change the front face. 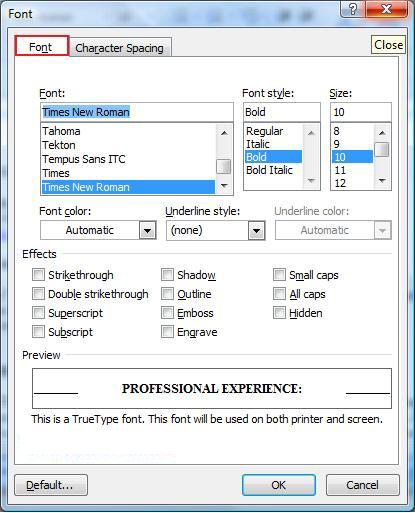 Font Size : This option is used to change the font size. Bold (Ctrl + B) : Make the selected text Bold. Italic (Ctrl + I) : Italicize the selected text. Underline ( Ctrl + U ) : Underline the selected text. Strikethrough : Draw a line through the middle of the selected text. Sub script (Ctrl + = ) : This option is used to converts the selected character into text below line. Super Script ( Ctrl + + ) : This option is used to convert the selected text into text above line. Text Highlight Color : Make text look like it was marked with a highlighted Pen. Font Color : This option is used to change the text color. Clear Formatting:Clear all the formatting from the selection leaving only the plain Text. Underline Words ( Ctrl + Shift + W ) : Selected text will get underline for each and every word separately. Change Case (Shift + F3) : Change all the selected text to Upper Case, Lower Case, and Sentence Case ,Capitalize each word (Title Case) and Toggle Case. Grow Font : (Ctrl + J) (Or) (Ctrl +Shift + > ) : This option is used to increase the font size. Shrink Font (Ctrl + [ ) (or) ( Ctrl + Shift + < ) : This option is used to decrease the font size.